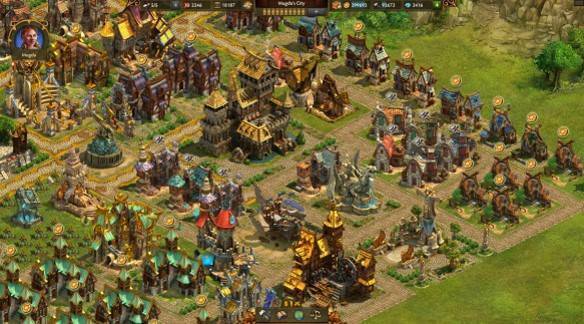 This free to play strategy MMO transports players to a world of fantasy where Humans and Elves have discovered a new land in which to settle and build up their own kingdoms and you, as one such settler, must found your own village, raise it from nothing, seek out new technologies to expand, upgrade and improve the lives of your people. Elvenar is more than a city building MMO and offers extremely tactical and strategy focused combat elements where players will go head-to-head against challenging AI enemies in turn based battles across a hexagonal combat map where they must choose each move carefully and plan a strategy to defeat their opponents. The game is completely browser based and so players are not required to download any client to play it. As either an Elven or a Human village, the chosen faction determining the look and theme of your village and people, players must seek out and produce various resources in order to establish an efficient and prosperous village. Acquiring resources is important, whether creating tools in the workshop to help construct buildings or food and beverages to feed your people, building Residential homes to bring in more settlers who will share a portion of their wealth and granting you gold or even trading with other players. To advance your settlement players will have to progress down the extensive technology tree, uncovering the various discoveries that will improve their village, grant access to new buildings and also allow players to train up deadly military units. Each technology requires a set number of Knowledge Points as well as gold to unlock it; similarly players must also have previously unlocked the technologies prerequisite techs before gaining access. Knowledge Points can be earned automatically, with players being granted one point per hour, through events and quests will yield them, but they are more commonly through acquisition of Relics. When examining the World Map the land itself is broken up into hundreds of tiles, unexplored land in this new world that when the player sends out a Scout they will bring back information about the province including the key locations within it that hold Relics as well as the potential threats that defend them. Players can peacefully negotiate by spending money to purchase Relics, each Relic granting one Knowledge Point, or they can try to forcefully take them and fight the inhabitants. Combat is an instanced based battle between player’s allocated units and the defending enemy opponents, the battlefield consists of a map broken up into a hexagonal grid that both players and opponents will take turns to move their individual units around. Units have their own set number of hexes that they can move as well as an attack range (either ranged attacks or melee) as well as some units having powerful debuff support attacks that can reduce defences or enemy damage. The map itself has a number of terrain features such as trees and rocks that can be hid behind for cover or used to funnel the enemy into a certain position to take advantage of them with a superior strategy.